To get a better contrast on the photos a dark-coloured Wool Crepe is used for this example. 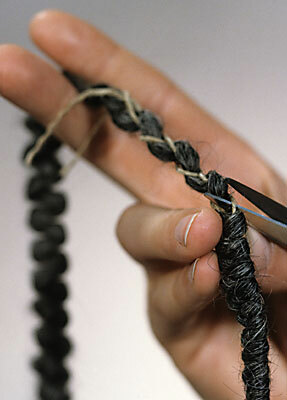 Pull two braids of about 20 cm Wool Crepe loose from the strings around which they have been wound. If you feel resistance, you cut the strings loose so that you can continue. Pull the start of the straight-edge cut pieces loose, so that their ends become fluffy. Straighten out the parts you are working with, using a curler, styling tongs or an iron (on the 'wool' setting). Do not pull it too hard so the braids remain intact. Now make the pieces that you are working with longer and looser: run them through your hands and pull them gently bit by bit in the lengthwise direction, but so that the pieces still remain intact.